This Lovecraftian role playing game pits investigators against the forces of the Cthulhu Mythos AND Axis forces in World War II. The result is a dramatic and thrilling gaming milieu with a wealth of horrors and large explosions. Written by Chris Birch, et al. 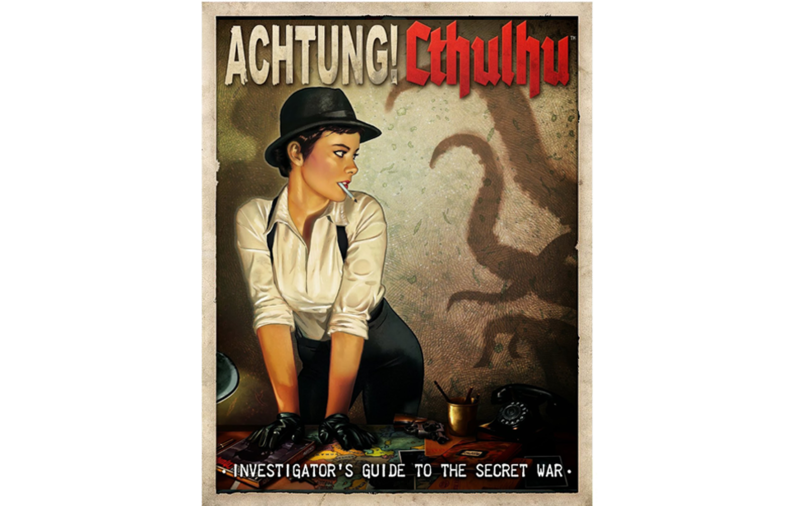 The team at Modiphius has created a new gaming environment for Call of Cthulhu (though Achtung! Cthulhu's rules also are written to be played with the Savage Worlds gaming system). They've provided ample research regarding World War II and its many facets. They've created new rules to deal with situations that characters are likely to run into in a World War II setting which are unlikely to occur in a traditional Call of Cthulhu game (imagine Henry Armitage driving a Panzer tank up Sentinel Hill!). Last, they've created a rich backstory unique to the game which infuses the rise of the Third Reich with the mythos. This source material combines with some complex and exciting gaming scenarios and campaigns which will throw investigators into horrifying and exciting situations around the globe. I was first drawn to Achtung! Cthulhu after seeing their books at S.F. Bokhandeln in Göteborg, Sweden. The cover art, attributed to Pintureiro, is simply spectacular and immediately sets the tone of Lovecraftian horrors colliding with World War II. It's important to point out that Achtung! Cthulhu is not published in a single book or boxed set. Rather, the rules are released in two books: the Investigator's Guide to the Secret War, and the Keeper's Guide to the Secret War. These are sourcebooks, filled with the necessary reference information for Players and Keepers alike. Investigators can create characters from all kinds of military and paramilitary backgrounds and equip and arm them appropriately. The Keeper's guide is filled with reference materials and rules to help game masters manage the task of playing in a world at war. Modiphius published additional standalone supplements for gaming in North Africa, the Eastern Front, the Pacific Front, and a collection of Terrors from the Secret War. On top of all this, they've published books containing adventures and campaigns including: Shadows of Atlantis, Assault on the Mountains of Madness, The Trellborg Monstrosities, and others. 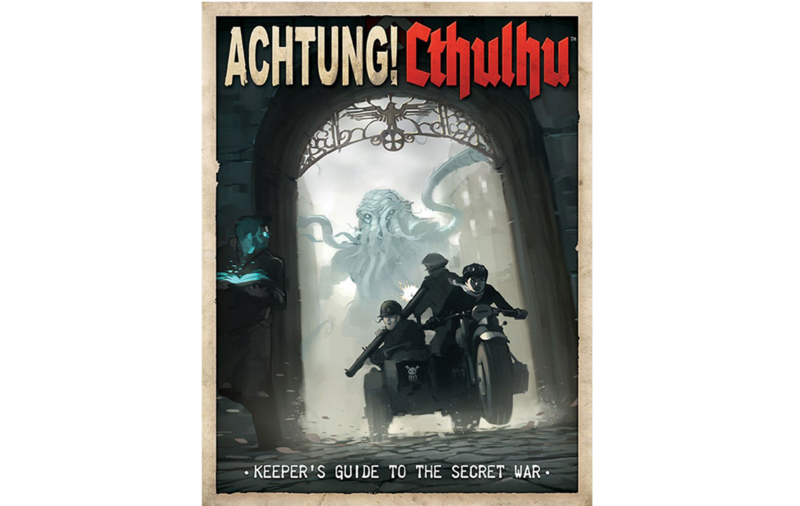 Because Modiphius is a large and well-established game publisher, they also have published their own cross-over games, taking the Achtung! Cthulhu milieu into other game systems. They sell miniatures, posters, patches and other products tied to the system. All of the Achtung! Cthulhu game books I have are lavishly illustrated with photos and terrific artwork which enriches the vibe of the game. I will confess that I have not played Achtung! Cthulhu extensively. This review is based on my experience as a Keeper through a two session adventure called "Three Kings". I have no doubt that spending more time in this world would give me a more nuanced appreciation for the different writers and styles of storytelling used throughout the various published scenarios. That said, playtesting at HPLHS Headquarters revealed the following. First, and perhaps most importantly, players all reported really enjoying the World War II setting. They relished the cinematic drama intrinsic in investigators being pitted against the Nazis and pulse pounding drama of machine guns, grenades and half-tracks. Like Pulp Cthulhu, Achtung! Cthulhu offers a more action driven experience than a standard game of Call of Cthulhu. Things blow up and investigators must be bold and aggressive to stand any hope of thwarting the forces they're pitted against. All of our players said they would be eager to return to this setting. I would suggest that Achtung! 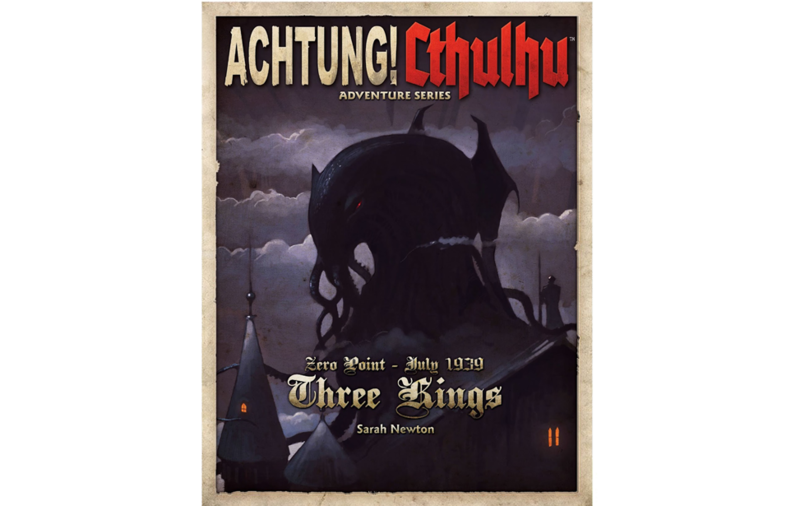 Cthulhu, or at least the adventure "Three Kings", is not an easy one for beginning Keepers. The source material sets up the basic forces at work in the scenario, but Keepers and players are left to their own devices to formulate a plan and see what happens. While this isn't necessarily problematic for an experienced Keeper, a beginner might find it challenging to steer the investigators toward the key plot events. The only other minor complaint I have is with the player handouts. Modiphius has gone to great pains to create "realistic" props, yet a few poor decisions leave their props being much less realistic than they might have otherwise been. All of the Achtung! Cthulhu books are printed using the aesthetic of pages of old military memoranda laid on the pages of the book. The player handouts are also printed to look like old military memoranda and briefing papers. However, to create this effect, they do things like including paperclips in their art. When you then print up the handouts, they have pictures of paperclips on them, which undoes all the believability they were intended to create. The HPLHS likes good props and it would work much better if people printed clean copies of the props and simply affixed them to each other with a real paperclip. 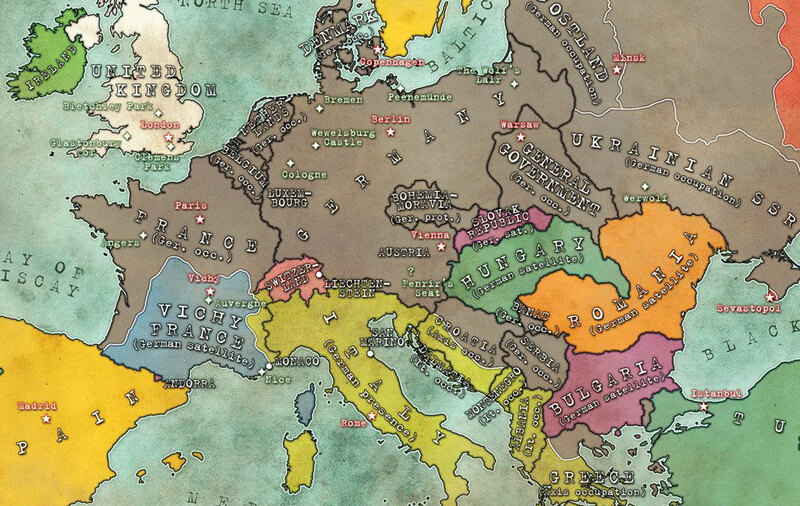 Maps were important in WWII and the Modiphius books have lots of nice color ones. Someone made the unfortunate decision that the maps would look more "old fashioned" if they were labeled in a typewriter font where most of the type is negative (white on black). Anyone who has used a real typewriter would know that (a) it's really hard to get it to type in white, (b) it's very difficult to do curved type on a typewriter, and (c) it's very difficult to have different font sizes coming out of a typewriter. But hey, it's a small point and is unlikely to squelch anyone's fun while they're blowing up a half-track filled with Nazi SS officers. One concern I raised with my players was whether any of them we're bothered at all by playing a game based on real world events. World War II has its own wealth of heroes, monsters, and victims without adding the Cthulhu Mythos on top of it, and it could seem disrespectful to heroes and victims alike to make a game of their experiences. None of the players felt this was an issue at all — eighty years of precedent with WWII movies, games, stories, and more paved the way for this kind of a role playing game to be without moral qualms. Call of Cthuhu players looking for a new backdrop for their gaming are likely to have a great time with Achtung! Cthulhu.